This book examines young people's involvement in crime (including crimes of violence, vandalism, shoplifting, burglary and car crime) as both victims and offenders. Although adolescence is the time when involvement in crime peaks, few previous UK-based studies have attempted to provide a methodical and comprehensive understanding of adolescent offending on a city-wide basis. 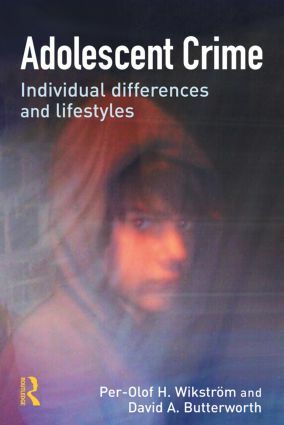 This book seeks a better understanding of adolescent crime by studying the relationship between individual characteristics (social bonds and morality and self-control) and lifestyles (as defined by delinquent peers, substance use and exposure to risky behaviour settings) and their joint influence on adolescent involvement in crime, against the backdrop of the juveniles' social context - taking into account family, school and neighbourhood influences. The findings of this study suggest the existence of three main groups of adolescent offenders; propensity induced offenders, life-style dependent offenders and situationally limited offenders, groups of offenders having different causal backgrounds to their crime involvement, and who therefore may warrant different strategies for effective prevention.